So I am a bit of a gadget enthusiast, to put it mildly. And as a result, my boys are turning into little gadget lovers themselves. I don't mind them playing handheld video games or with my iPhone as long as it is done with moderation. Plus, sometimes mom needs a little help getting some peace and quiet! 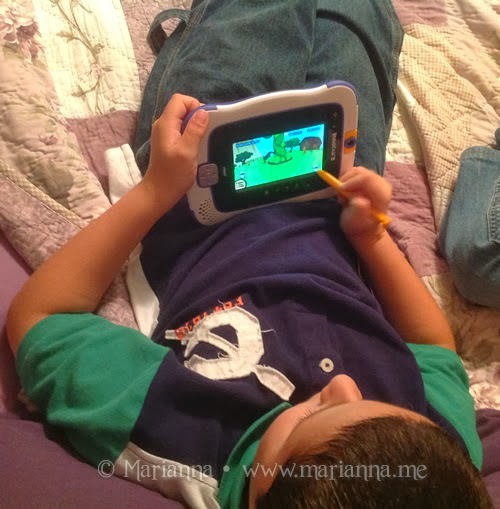 Last year we got the chance to review the VTech InnoTab 2 tablet and they instantly loved it. 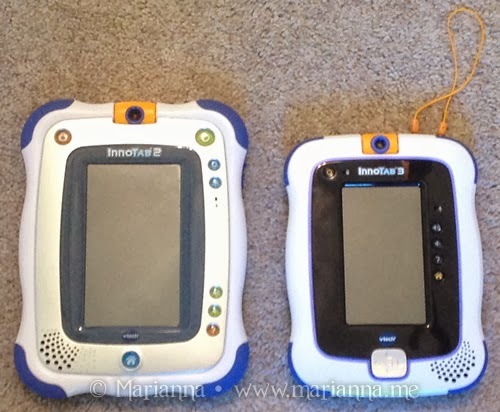 Now Vtech has the InnoTab 3 and we were anxious to get our hands on it to give it a test run. The InnoTab 3 combines educational games, creative activities and reading skills in a child-friendly, multi-function, touch screen tablet to make learning fun. 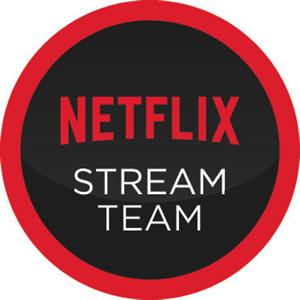 Your child can even embark on fun, educational adventures with their favorite characters such as Doc McStuffins, Sofia the First and Jake & the Never Land Pirates. 4 game styles: touch screen, motion, D-pad and sound-activated. Kids can import their own music to create MP3 playlists. The Art Studio allows kids to color, draw, paint and decorate with stickers, stemps and more. In the My Magic Beanstalk interactive game, kids take care of their beanstalk by watering it to make it grow. They'll also harvest and collect beans, learn parts of plants and collect trophies along the way. The InnoTab 3 comes with the tablet, 2 stylus pens, 1 stylus cord, 1 game cartridge, 1 USB cable, 1 Learning Lodge Installation CD-ROM and 4 AA batteries. Do you know what it is like when a new kids toy or technological device arrives in my house and 4 kids want to play with it at the same time? Well I'll tell you: utter and complete chaos! Which is just a testament to how much the enjoy playing with it. One of the great things about VTech products is the Learning Lodge Software. It allows you to connect your devices to track and monitor your child's progress and also gives you a plethera of download to purchase. The Learning Lodge features more than 350 educational games, e-books, music and videos developed specifically for each child’s unique stage of development and includes a broad library of subjects like reading, math, social studies, science, creativity, problem solving and so much more! Once you install Learning Lodge onto your computer and register your new device, you are given one free download. Your free download allows you to choose from a specific list of apps or eBooks. 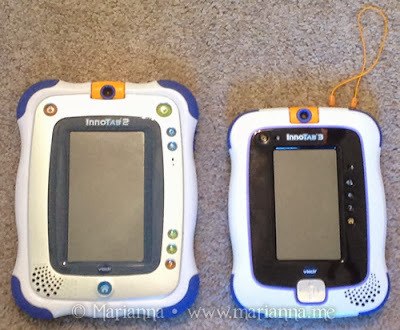 Apparently, I still had some free downloads left over from the last few VTech items I registered, so we were able to download a couple of educational apps onto our new InnoTab 3. The stylus cord is a life saver. I cannot tell you how many times we misplaced both InnoTab 2 stylus. One end of the cord attaches to the stylus while the other attached to the tablet. Now that little pen will never fall between my couch cushions again! The smaller design, compared to the InnoTab 2, makes it easier for tiny hands to hold. This means my 3 year old can get a good grip on it as he rips it out of the hands of one of his older brothers. There is really a great selection of apps to choose from. I was able to look for titles in specific categories (u.e. math, problem solving, etc.) to make sure I had a little bit of everything covered. 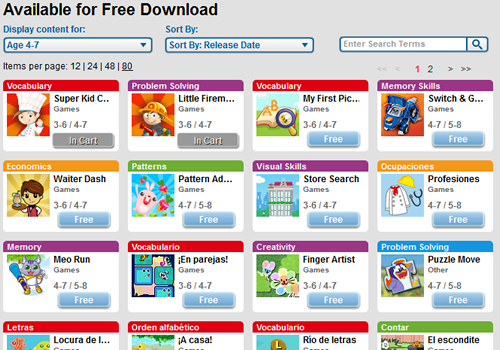 In addition, there are also character themed games and eBooks that kids will love. I love that all of the games and apps are educational so you don't have to feel bad about them having a little screen time with their InnoTab. Great color on the screen. The 4 AA batteries that were included in the package were a nice touch and let you get stared right away. The games, of course! Their favorite game happens to be the Switch & Go Dino one that I was able to download for free. They are definitely playing this the most. While the smaller design is nice, I was disappointed to see that the screen also got smaller too. I would have rather they kept the overall size of the tablet larger to keep the screen the same. The battery life is short, especially when being used by multiple children. The InnoTab 3 takes 4 AA batteries and I find myself having to replace them pretty much every other day. If you are going to invest in this product, I also suggest you get the Rechargeable Power Pack which will save you a ton on batteries in the long run. Overall, we are once again pleased with the latest VTech InnoTab learning tablet. I only wish I had more of them so I didn't have to listen to the constant bickering of who's turn it is to play. 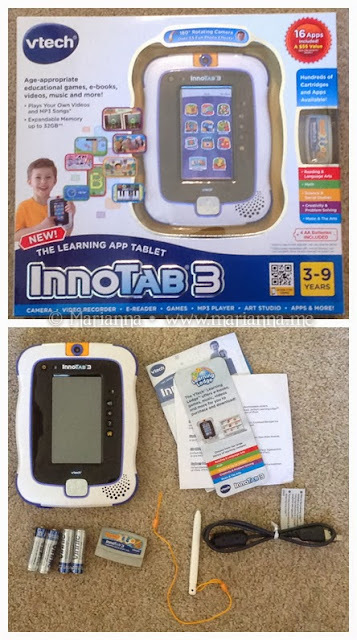 The InnoTab 3 may be purchased at VTechKids.com or at various national retailers like Target, Walmart and Amazon. ARV is $69.99 and it is suitable for children ages 3 to 9. One (1) lucky winner will receive a VTech InnoTab 3. Open to US residents only, giveaway will end on September 26, 2013. Please use the Rafflecopter form below. Good luck! I received a complimentary product in exchange for my review. All thoughts and opinions are my own. 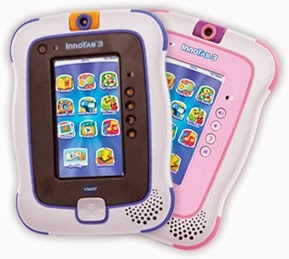 The InnoTab 3, information, and additional gift pack have been provided by VTech. I think my kids would LOVE the Camera and Games of course. They love getting their picture taken as well as being the photographer. <3 Thanks so much for this AMAZING Giveaway! Thank You so much for the chance at winning this!! My child would love the idea that he has his own tablet, that he can pick things to read or play. I am sure he will like that he can have his own ebooks & music!! My daughter would love this. We are always looking for good learning devices. I think he will love the camera! My kids would like that they have so many games that can go with it. And also the MP3 player. My kids would love the camera! they will love the camera. The camera would be my child's favorite feature, so cool! My granddaughter will love the built in camera, she always wants to use mine. This would make an awesome Christmas Gift for my nieces daughter. I think my grandson would like the character themed games. I would love to win this for my god daughter for her birthday! The camera. My son loves to take pictures. A great intro to the world of portables for the kids. My daughter would like the Art Studio! My son would love the 180 degree camera and video maker the most. all the different apps and games! My daughter would love the apps best. My kids would like the games the most. My kids would love the camera feature. My children would love the camera feature. My daughter would like the rotating camera feature! My granddaughter would love the camera feature. My kids would love the camera app! My daughter would like the camera, she loves taking pictures. there is so much my son would love!! the rotating camera and all the effects allt he apps and characters like Doc McStuffins and Jake & the Never Land Pirates which is his absolute favorite!! I think my niece would like the movie maker the most. I like that it has an MP-3 player. My son would love that! With the amount of game on it I am sure there will be something for all of them to play. My son would love the camera app! I like how it functions like a kindle. They would love the games and the camera part!! My daughter will love that it comes with a stylus! Mine would probably like the camera the most. I have 10 year old twins and while they are over of the recommended age range for the Innotab, I have a feeling they would still enjoy playing with it. Their favorite features would be the camera and the MP3 player. My granddaughter would like the camera feature. I like that there is so many different downloads to choose from. We can purchase downloads for my son and some for my daughter. The camera is always a hit with the younger ones. I know that my son will like the camera and mp3 player! My son would love the games. He is already addicted to the ones on my phone. My son would love the games for sure, but he would also like the camera. The camera for sure! My daughter loves to take pictures. I think my daughter would go nutty with the camera function. I know I have to check my phone and iPad every time she's had them to see how many pictures she's taken. I think they'd like the Art Studio best because it will allow them to color, draw and paint. Thanks. would be perfect for my neicies birthday! Definitely all of the different games she could play on it! My son will like the camera the most. My kids will love the e-books! Maybe I can finally have my Nook back! My kids would love the camera! I have to delete their "Selfies" every couple of days off my phone. My kids would love the games and the fact that it is for kids. My daughter would love the 1800 rotating camera and video recorder. the built in camera, my son loves to take pictures! I love that there are free apps available! My son would love the camera...he loves taking pictures. My granddaughter would love the camera. I think she'll just love the camera. She loves to take pictures! It would be a toss up between the games and the camera! Kids will love the camera - thank you. They would love the camera. They love taking pictures. I know that my grandson would love the games and he would LOVE the camera! My grandson would love the camera and the games most of all! My grandson would love the mp3 player the most! He loves music!! She would love the The MP3 player, because she loves to sing along with her favorite songs. Thanks for this contest. I think my son would love the camera. The camera is a nice touch!